I remember 14 years ago, as we were finishing the book Better Thinking, Better Results, Orry Fiume (retired vice president of finance and administration at The Wiremold Company) told me: “It’s a good thing not every company is Lean, otherwise there would be 30 percent unemployment.” Fortunately, we don’t have that to worry about. But here is what we do have to worry about. Executives who think Lean means ceding knowledge and power to lower-status people, Lean is a quick solution to long-standing and complex problems, and maximizing the cost-reduction associated with process improvement by laying people off. Employees who think Lean will do them harm by de-humanizing them, speeding them up, burning them out, de-skilling them, taking away their knowledge, taking away their creativity, and losing their job. The profit motive of managers and the job motive of employees immediately establishes conditions for distrust. Remarkably, these fundamental problems span generations of people in business. These same fears have been present since the dawn of progressive management more than 125 years ago. And they severely limit people’s interest in Lean management. The countermeasures are few in number and more similar than different. For example, a common countermeasure is to prove the benefits of a Lean planet by producing a steady stream of success stories. Good news stories can indeed be influential, but they ignore the actual struggles that go into making something a success, as well as the failures. Opportunities to learn from failures are largely extinguished. This does not represent reality; only some of the facts have been presented, not all facts. It is Marketing 101. You will gain customers seduced by the promise of something better, but most will also quickly abandon it once they realize the product over-promised and under-delivered. Of course, Lean itself does not under-deliver, but it is an easy scapegoat for users’ difficulties in comprehension and practice. This reminds me of the much-heralded business school case study, in which cases describing business success far outnumber case studies describing business failure. The use of case studies, particularly in MBA programs, has led to legions of graduates in powerful positions with amazingly poor critical thinking skills. (Note: Professors were often consultants to the businesses that they wrote case studies for, which was largely undisclosed and therefore a clear conflict of interest. Self-interest is often one of the strongest motivations behind writing success stories). Lean people must develop great critical thinking skills. They will not develop that capability by reading Lean successes stories. Additionally, good news stories have a greater impact on those who already support Lean, but less impact on those who think Lean does harm to people. In other words, the Lean success stories preach to an already converted audience, and does not reach the intended audience – the skeptical and the non-believers. Evidence of good results is unconvincing to many. That may be illogical to you and me, but it is logical to them. Lean is a minority management practice that hopes to gain acceptance among those who favor the the majority management practice. What we have learned over the last 30 years is that people will accept parts of Lean management – some of the tools and methods – to the extent that they do not change established systems and norms that retain the majority management practice. For Lean to overcome its minority status, many important social, political, and economic barriers must fall or undergo significant modification. This includes, especially, creating an economic system that respects people. That may be an insurmountable task, given that the current system of economic thought and practice has been in existence for more than 240 years. It is deeply entrenched and its followers are unlikely to modify their views for some time to come. The pursuit of self-interest aligns much better with status-quo, the majority management practice, than it does with change. Rather than learn something new, many people follow the maxim, “Better the devil you know.” The devil is batch-and-queue processing (and associated management and leadership routines), the most resource intensive economy for production of goods and services. Its focus on unit costs ignores total costs and externalities. Unit costs can easily be measured and managed, but much less so for total costs and externalities. Measurement is difficult and management requires cooperation and teamwork among organizations in industry. Flow processing is the least resource intensive economy for production of goods and services. Total costs and externalities are understood to be great and efforts are made to minimize them, despite any absence of data that may exist. This is a change in thinking that has proven to be impossible for most people to make. Therefore, flow production, since its invention centuries ago, remains little more than a curiosity for most people. Economists love incentives (but not enlightened self-interest), and believe incentives are essential to get people to modify established habits of thinking and practice. That is their countermeasure for almost any problem in existence. But humans beings are not always rational actors, so incentives are likely to appeal only to a minority – and likely those who were already inclined to make the change. Incentives or not, there may exist a steady ratio of people who have had good experiences with Lean and people who have had bad experiences with Lean. Does this result in nullification, such that the ratio of Fake Lean to Real Lean to No Lean remains relatively constant over time? 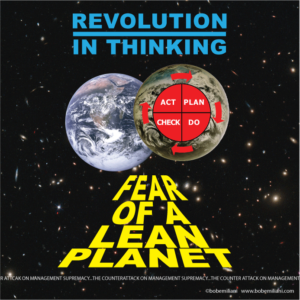 What, then, are we to make of the great effort and expense to promote Lean with the aim of creating a planet that is Lean? Fear of a Lean planet is deeply rooted across multiple dimension of human thought and action, including, it seems, base instincts. Is it human nature to fear Lean in the same way it is human nature to fear snakes, spiders, or other things that could do harm? If so, then perhaps we have not understood the problem we are trying to solve. Toyota’s management system (popularly known as “Lean”) is a major innovation in management thinking and practice. As with any innovation, people evaluate the risks and benefits prior to its use. Both managers and workers see different risks and benefits, resulting in large gaps that have proven to be difficult to close. The CEO playbook is filled with dozens of methods and tricks to achieve typical business goals and objectives. To leaders, Lean is just another play in the playbook. It is not. Little do most managers realize that Lean is the toughest path that one can choose to achieve company goals and objectives. Risks are either over- or under-estimated. Rarely do leaders correctly understand the risks of Lean transformation. Employees, the heart and mind of continuous improvement, can easily imagine new forms of social, economic, and political inequities, similar to those that they have had to endure in recent decades. The harm that Lean can do to them seems obvious, with no need to either investigate it or experience it. Even if Lean has been proven to be safe elsewhere, employees see great risk, particularly in the short-term. Lean changes the cultural identity of a people and the business, which is at odds with managers’ and employees’ desires to maintain continuity. So, there is a fear of losing something of value that had long contributed to individual and organizational success. These are the needs of people and business, today and tomorrow. Have we been doing the right things to close the gap between fear of a Lean planet and meeting these needs? Hi Bill – Same to you. This is a weekend to remember the good work of labor and also the tragedy endured by labor in cases where leaders thought of Lean as nothing more than cutting heads. That such outcomes occurred for more than two decades is a demerit against the leaders of the Lean movement. As far as profit sharing goes, Lean management seems to work best in organizations that have profit sharing. Thanks Bob, the hot button here for me is “self interest”. In lean our interests should be on our customers and our people, not ourselves. Thanks for always reinforcing lean concepts for me. Hi Bob – You’re welcome. You are correct about where interests should lie. Leaders are anchored by classical and neo-classical economics which says interests should lie with self, which then automatically does good for others. Of course in Lean, outcomes must be non-zero-sum (win-win) for continuous improvement can prosper. It’s a fancy way of saying that Lean requires sharing in order to succeed, while selfishness quickly leads to failure. Selfishness is a big driver of fear of Lean.